Our Lands Speak: 1974: Getting Ready to Dig the Draper Site, Part 2 | Bill Finlayson, Ph.D. In my last blog, I detailed the work involved in completing my Ph.D. dissertation in 1974. During the summer of 1974 much of my time was spent preparing the draft and final copies of the first four chapter of this dissertation. At the same time, I received a small contract from the Archaeological Survey of Canada to develop the computer programs we would need to process the massive amounts of data we would retrieve from the 1975 excavations at the Draper site. I was extremely fortunate that the Social Science Faculty had established the Social Science Computing Laboratory (SSCL) to assist faculty members such as myself to develop the computer programs required for their research. As noted previously, I had used their services to describe and analyze the pottery vessel fragments from the three Middle Woodland sites I excavated for my Ph.D.
We decided that we needed three different processes to deal with the data from the Draper site. First, we would require a custom-designed computer program to process the artifact catalogue which would detail the number and kinds of artifacts recovered from the different features we excavated at the site. We had the assistance of Don Teare from the SSCL to create this program. We designed a catalogue form to be filled out by the artifact cataloguers in the field laboratory. 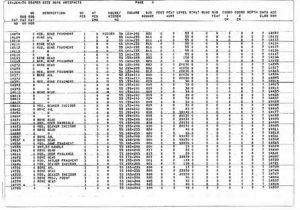 The data on these forms was then entered into a computer and after verification could be used to produce a complete catalogue listing of all artifacts recovered from the dig. The program would also produce listings of the different classes or categories of artifacts (e.g. all bone tools or bone beads) (Figure 1) which were made available to the individual researchers who would be studying and reporting on these artifacts. In addition, we developed codes for the detailed description of the various attributes (observations) made about each individual artifact. Each code contained data on the location of the artifact within the site and various observations which were worthy of investigation. This included things such a length, width, and thickness of each object as well as observations about how the object was made or decorated. I worked with Peter Ramsden who was co-director of the 1975 excavations on developing a code for the study of the pottery vessel fragments based on his research on these artifacts from 28 different Huron sites in southcentral Ontario. I also worked with the other analysts to develop codes for their different artifact studies. The data collected was processed using the Statistical Package for Social Sciences, a program I had used in my Ph.D. research. I partnered with Stan Lopata of SSCL to create a program which would produce computer drawn maps of the houses, their internal features such as hearth floors and pits and palisades. Before classes began in September 1974, I taught an informal field school with students enrolled in a research course in the Department of Anthropology at The University of Western Ontario. We dug part of House 2 at the Crawford Lake site and tested the Lopata’s program and then made improvements to it for 1975. The collection of settlement pattern data involved the completion of a set of forms which were completed in the field. In 1975, we designed and produced custom pencil-marked computer cards which were filled out by the excavators after they had finished digging one or more 5 x 5 m squares in the field. In 1978, we took two key punch machines into the field and the data from the field forms were transferred to cards by data entry staff. The catalogue and settlement pattern data were transferred from the field to our laboratories at Western from which draft and final printouts of catalogue and maps were prepared. Using these programs, we were able to process the huge quantities of data recovered from our excavation. Catalogue data were made available to the various artifact analysts, and final plans of the longhouses (Figure 2) and segments of the village were completed to allow me to prepare a 600-page report on these data. 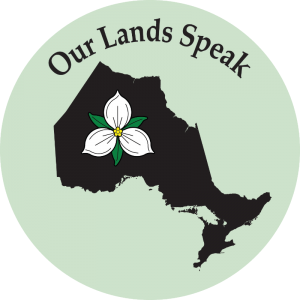 This was the first-time computers had been used to document, describe, analyze and map data from the large-scale excavation of an Indigenous site in Ontario, and probably Canada. Forty years later, I remain in awe of what we were able to achieve in 1975 and 1978 and how easy it is in 2019 to undertake similar tasks with commercially available programs such as Microsoft Excel and Arc-GIS with the assistance of D-GPS units accurate to a few centimeters. I am also increasingly aware of the great potential for the analysis or re-analysis our excavated data from the Draper site to pursue new problems which will contribute to provide a greater understanding of the Late Woodland occupation of West Duffin Creek in southern Ontario. Forty years after the completion of excavations, Draper remains the most significant Late Woodland site in southern Ontario due not only to the systematic complexity of the occupation of the site but of the huge numbers of artifacts off all classes which provide insights not possible from sites with much smaller samples of artifacts or settlement pattern data which are chaotically complex. I will be exploring some of these issues in future blogs. 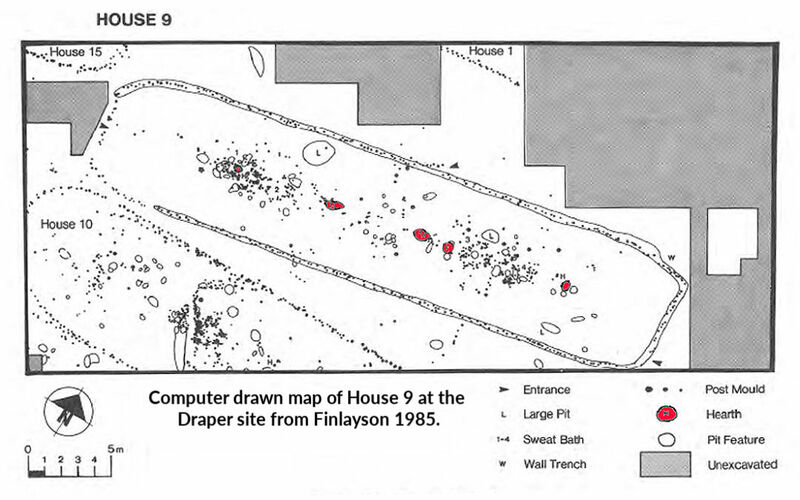 1985 The 1975 and 1978 Rescue Excavations at the Draper Site: Introduction and Settlement Patterns. National Museum of Canada, National Museum of Man, Mercury Series, Archaeological Survey of Canada, Paper 130. 626 pages.